The Open Garden scheme is a fine British institution. Run largely by volunteers for charity, it provides access to private gardens and for we garden-openers, the satisfaction of sharing our pride and joy. Known universally as the ‘yellow book’, an annual publication describes gardens open in England and Wales. The same information is provided in free booklets for each county. Click the Yellow Book link on the right to get even more detailed information on the net. The link leads you specifically to Peter and Julie Williams' garden, open next Sunday (May 5) in my own village of Seaton Ross. 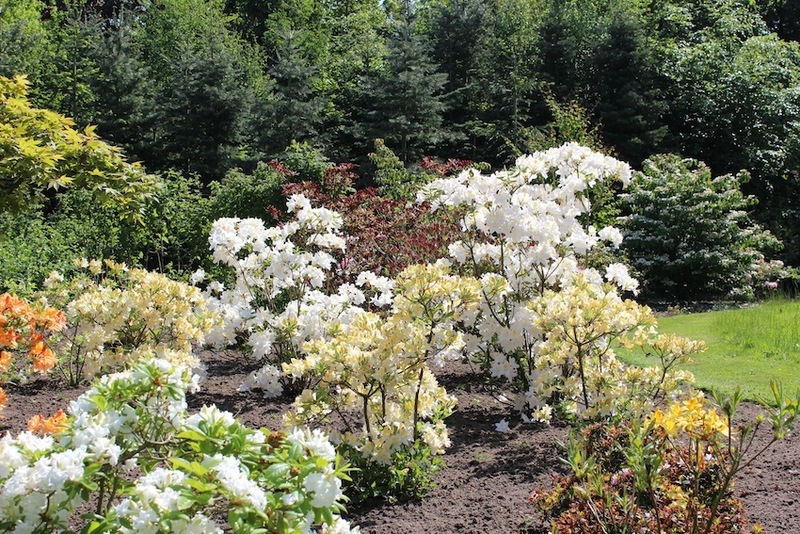 Peter and Julie have developed their garden over forty years. Since Peter’s retirement, he has had the time to put ‘icing on the cake’ by extending his existing fine range of beautiful and rare plants. Most of his five acre garden can be inspected next Sunday. Much of the garden is in woodland, where well managed, lovely trees provide structure and protection for underplanted shrubs. These, in turn, give background and shade to an understory of naturalised herbaceous plants and bulbs. The garden is furnished with some spectacular garden features and adornments. Peter is a craftsman in wood and his summer-house is a sight to behold. Unusually for the York area where the soil is generally alkaline, at Seaton Ross it is acid and Peter’s garden is full of acid loving plants. Next Sunday is a particularly fine time to see his azaleas, rhododendrons and magnolias, This peculiar season has telescoped together a large range of normally seasonally divided plants. A delightful feature - especially if it rains - is a very large polythene tunnel, where not only is there an extremely fine display of plants, there is also a wide range of exciting plants for sale. But let Peter’s own fine pictures now do the talking. About Peter Williams, the man who greened Yorkshire’s slag heaps. Thirty years ago, when you travelled north on the motorways, unsightly pit slag heaps painted a dreadful image of the North. Not any more! A huge national effort was made to restore the colliery remains. Peter, as a post-doctoral research-fellow at the University of York, studied and researched the recycling of colliery spoil. The team in which he worked provided much of the information needed for the successful restoration project. Although a wide range of ecological and horticultural management principles were involved in the process, perhaps the most significant was adding huge quantities of lime to counter the extreme sulphur-derived acidity in the waste. Peter tells the story of how he recently took a post graduate student to study the ecology on a twenty year old reclaimed site. A measure of his success was that it had merged into the natural landscape so well that he failed to find it! Yorkshire Wildlife Trust has recently adopted one of the reclaimed sites as a Nature Reserve at Water Haigh, near Wakefield! Formerly principal lecturer at York St. John University, Peter is an ecologist, plant physiologist, soil scientist, statistician and gardener. When you see his garden, I suspect you will guess which he loves best. He is a friendly gregarious Welshman. Be sure to to talk to Peter and Julie if you can get to their Open Day! You will certainly enjoy Julie’s fabulous cakes! A hundred years ago Yorkshire was the European centre of rhubarb production. Not only did huge quantities go by train, the rhubarb express, to Covent garden, further supplies went on to Paris. In a thirty square mile triangle between Leeds, Bradford and Wakefield early last century, there were 200 producers. After the war the industry fell into severe decline. Now on a much smaller scale, production has revived. Rhubarb is again fashionable. Wakefield has an annual rhubarb festival in February and the industry is now a tourist attraction. Yorkshire rhubarb is ‘forced’ in heated completely dark sheds. It was traditionally picked by candlelight and you could hear the plants grow as the buds burst. We used to take the students on an annual visit. We also would go to Cawood experimental station where director Frank Smith built up a huge collection of traditional varieties. Many varieties had debilitating virus which were ‘cleaned up’ by modern specialist techniques. The national collection now resides at RHS Harlow Carr garden. The now smaller rhubarb triangle is said to be between Wakefield, Morley and Rothwell. In some parts of the world rhubarb grows all year round but in temperate climates like our own, it has a winter dormancy and needs to accumulate cold before growth will restart in Spring. The rhubarb triangle is in a huge frost pocket between the Pennine hills and provides suitable chilly conditions! It is suggested that in the past, pollution in this industrial area, caused leaves to be shed early in Autumn and get the process of satisfying the cold requirement off to a quick start. Modern growers keep an accurate record of temperatures and when a specific number of ‘day degrees’ of cold are accumulated, they know the rhubarb can be forced in the sheds. Timperley Early, the variety I grow myself, is an example of an excellent rhubarb with a low cold requirement. Apart from the cold, other aspects of history and geography made the triangle eminently suitable for rhubarb. The soil is deep and fertile. There is heavy rainfall in the Pennines. The West Riding was well placed in emerging long distance transport systems. The local wool industry provided a plentiful supply of cheap wool-shoddy waste. This ‘manure’ is a nitrogen rich material that releases its bounty over a three year period. This is the time it takes rhubarb to attain sufficient size to be forced before exhausted, in early summer, it is thrown away! Soot can be beneficial to the soil and polluting sulphur helped limit fungus disease. Cheap Yorkshire coal fueled the forcing sheds. No longer. With the pollution, nothing else would grow - I think I might have made this one up! Some gardeners make an infusion of rhubarb leaves to control pests, although in view of the above it might not be a good idea! Apart from its well known laxative properties, before modern medicine, the drug rhacoma extracted from its root, was greatly valued for its healing properties. In the seventeenth century this drug sold for three times the price of opium! During the second world war the price of rhubarb was restricted to one shilling a pound (sounds expensive to me). Rhubarb is a rewarding vegetable to grow at home. Because it is so easy many gardeners do not give it the treatment it deserves. Plant it in full sunshine and feed it. It benefits from a generous late winter top dressing of growmore, or better, Yara mila complex or similar balanced fertilizer. If you mulch rhubarb with plenty of farmyard manure or compost it will really thrive. Many gardeners like myself do not force it but choose to pull rhubarb sticks right through the spring and summer. New gardeners sometime do not realise that when you remove the leaves from a plant you weaken it. This is inevitable with rhubarb as you eat the petiole (the leaf stalk). New plants need a year or two without cropping to get started and even with an established plant, too many pies and crumbles is not a good idea. As a completely unscientific guide, my own clump in full foliage covers slightly more than a square meter and typically I might pull ten stalks on about eight occasions a year! If I actually liked rhubarb I might get away with a little more! I don’t strip the plant and do not take more than 25% of the petioles at a single picking. One final tip. Do not waste your time growing it from seed and never plant rhubarb from a dubious source. If a friend offers you stock from a moribund plant, refuse, it’s probably virused. A month later and another pie, In a fortnight there will be another. By then the plant will be full size. It’s one of those plants which we all know by the wrong name!. Hippeastrum is the correct name of the genus, Amaryllidaceae is the name of its family and Amaryllis lily the common name of the plant! 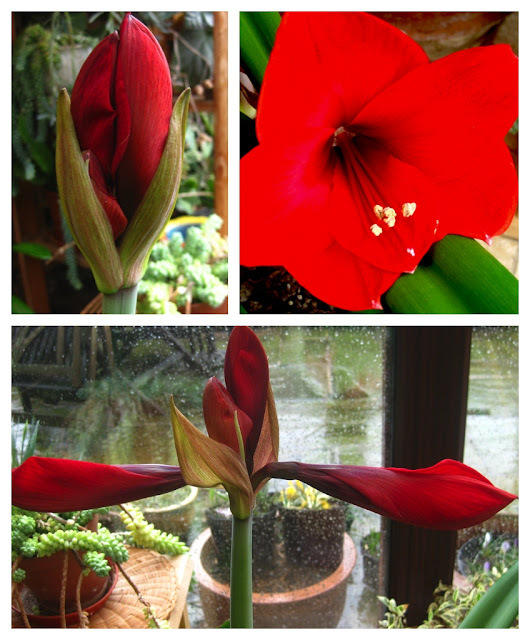 To add to any confusion, the ‘true’ amaryllis is a very fine cold greenhouse plant. Hippeastrums are not hardy and will not stand frost. They like to be warm and low temperature is one reason they can be a ‘difficult’ houseplant. In addition light levels in the home are usually low. These lilies need to be grown in the light of a south facing window or as in my own case, grown in a bright heated conservatory to thrive. My friends Mike and Isobel grow a single bulb in a pot. Compared to my own multiple planting they avoid un-coordinated flowering times and variation of height. It’s only in recent years I have grown this plant. 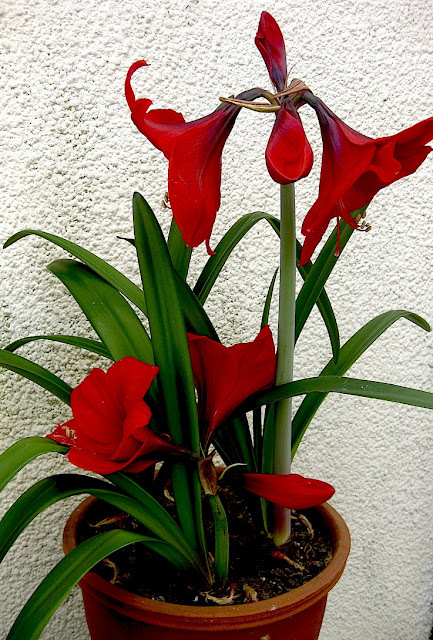 I had previously regarded it as a rather vulgar bulb that people buy, plant, and it flowers and dies. Sometimes it dies slowly over months or even years. On other occasions it is just thrown away! It is spectacular and from a purchased bulb quick to flower. It’s rapid development is unequalled as a motivator to a child with a potential interest in growing plants. Some years ago I was tempted to buy four bulbs at the wonderful ‘floating’ flower market in old Amsterdam. The following year, as the last of the big spenders, I bought three more! From the vendors pictures the latter purchase would have beautiful pink flowers - dream on! It is nice to have holiday gardening souvenirs but not always wise. I would have been better buying firm, healthy, correctly named, varieties from Parker’s Wholesale! For a start none of the seven bulbs were the advertised colour and in the second batch only one flowered. Four months after purchase the bulbs had rotted away! Fortunately some secondary bulbs emerged and survived. I confidently expect some red flowers next year! Bulbs from my 2011 purchase. Primary bulbs have unfortunately died. At least two of these secondary shoots will flower next year provided they are allowed to naturally die down. It’s the lack of good quality light in the house. It’s also the undisciplined nature of the plant. Sometimes the leaves appear before the flowers, at other times the flowers are first. The real secret of successful growing is to look after the leaves and ensure they get plenty of light and to keep them in healthy growth as long as you can. When the foliage starts to die down, usually in Autumn, let them shed their leaves and withhold water. They are telling you they want to rest! 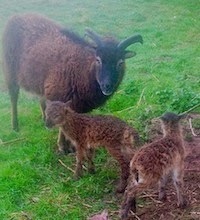 Similarly when they start up, take their cue, and water and feed. One of the biggest causes of death is when the inexperienced gardener continues to give too much water when they die down. I have to admit I have just the right conditions for my two pots of ‘amaryllis’, a heated conservatory that receives full morning light and a cold greenhouse to which they can migrate for the summer, any time soon. I have the further option of standing them outside after all danger of frost has gone. A reservation about over prescriptive gardening advice. 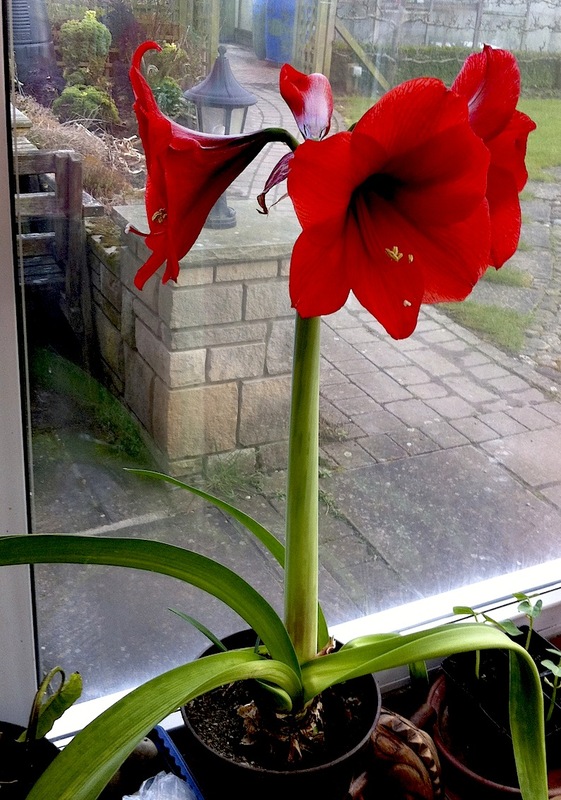 As cultural methods for ‘amaryllis are somewhat variable I turned to the RHS to check out a few points before writing this post. 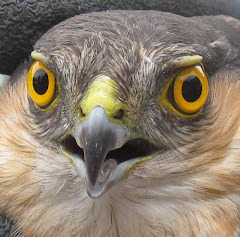 This link provides an excellent and detailed explanation of how they are grown. In my opinion, the article shares a fault with much of the gardening press. This is to give very precise instructions as to temperatures that plants must be grown. I have learned over the years to regard such recommendations as ‘ball-park’ figures, but fear that many new gardeners when they see great precision are ‘put off’ from trying. Nature provides huge day to day variations of temperature and plants still thrive. My own unheated cold greenhouse temperature fluctuates by large amounts and I propagate and grow a huge range of plants. If I followed the literal advice of gardening books I don’t think I would grow anything at all! Amazonian terra preta black-earth soils have existed for up to 2500 years. They were man-made by ancient charcoal making communities. Old settlements have been rediscovered buried under ancient rainforest and confirm the observation of early 16 century explorers that there was at that time widespread human amazonian habitation. 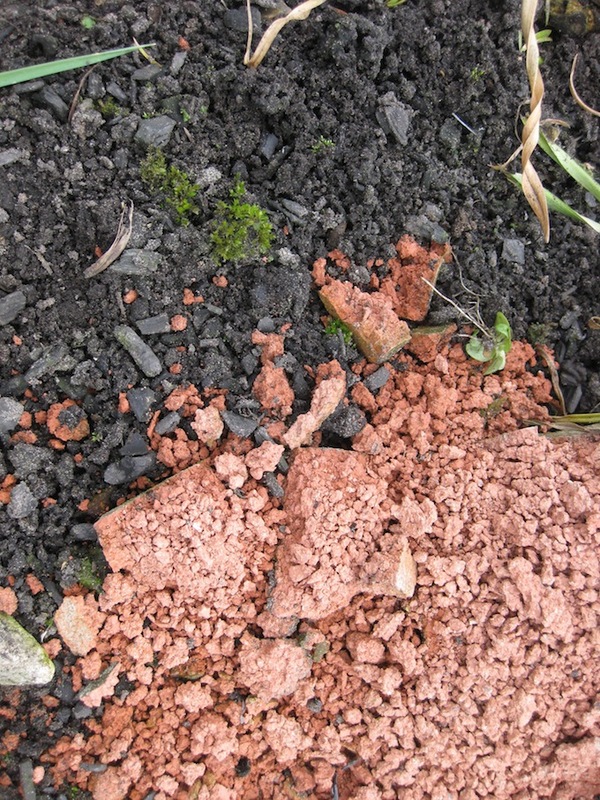 It would seem that ancient potters mixed their broken shards, charcoal, plant and animal waste in ancient middens and for uncounted generations added the fertile residues onto their soil. These terra preta soils even now, are up to two metres deep, fabulously fertile and high yielding. Charcoal provides within it’s deep pores a wonderful substrate for arbuscular fungi. These are the fungi that provide rich mycorrhizal associations with plants. The mycelium of these fungi is rich in glomalin, the recently discovered long lasting organic matter that comprises a significant component of the world’s soils. Charcoal in the soil has superb agricultural properties and holds plant nutrients, water and air. It reduces soil emissions of greenhouse gases such as methane and nitrous oxides. It is generally kind to all manner of soil life. Plants love it. In South America a native species of worm mixes it intimately with the soil. Best of all, carbon can be stable for millenia when sequestered in the ground! In recent years there has been intensive research into the agricultural uses of charcoal. They call it biochar and is made by a slow burning process known as pyrolysis. There is huge potential for farm wastes to be charred and returned to the ground. It’s a win-win situation. It can lead to huge increases in soil fertility and at the same time sequester a significant amount of carbon. For six years now I have been burning my bonfires to make charcoal. I do it by the simple expedient of dousing my fire with water and not letting the embers burn through. I have an annual fire to burn my bulky prunings at both cemetery gardens and on the village plot as well at at home and generate about six barrow loads of char each year. Char varies considerably depending on it’s source and method and temperature of its production. I cannot make any special claim for the black stuff made by my unconventional method but that has not stopped me having fun. Best practice is to shallowly cultivate biochar into the ground. As a none digger I have limited myself to applying it as a mulch on my vegetable garden, in the knowledge that future sowing and planting operations will work it in. I cannot, of course, claim any valid conclusions from my play. I have recently tentatively started using char as an ingredient in potting compost and as a soil amendment when planting ferns and other special plants that normally do not thrive in my soil. Fresh charcoal, like wood ash, often contains lime. It strongly absorbs nutrients and can initially deplete the soil. This can be corrected by mixing in multi-nutrient fertilizer into an outdoor weathering pile of char. I also suggest that char be tried as a constituent of a compost heap and that the gardener recreates the ancient midden to charge the charcoal with fertility. Such compost will have some permanent bulk and will not, like normal compost, all eventually decay away. With regard to my own efforts at composting I frequently have difficult choices of how to recycle the copious amounts of herbaceous tops that my garden generates each winter. Especially so, for plants with coarse leaves like miscanthus and other tall grasses with fibrous foliage. Fifteen months ago I prepared a heap composed of succeeding layers of fresh charcoal and large amounts of this strawy debris. It was supplemented with a few handfuls of a nitrogen-rich general fertilizer and a little dolomitic lime. I also added liberal amounts of aquatic vegetation, skimmed out when cleaning my pond. Still not completely decayed I have recently applied the product of my heap as a thick and fairly coarse mulch over my asparagus, rhubarb and soft fruit. The bottom of the heap will be a great place to establish my marrows and butternut squashes. The soil surface of my vegetable plot after six years. With an old brick I have inadvertently added my version of shards of native indian pottery! As a none digger my soil is undisturbed and there is no accidental damage when bulbs are dormant in Summer. As a result they are all over my garden! Some are in the most unlikely places. Perhaps because I am rather a scruffy gardener, they often grow among strawy debris and look far from pristine! This does not detract from the thrill I get as I wander round my garden and find the annual return of strong flowering clumps planted over the years. 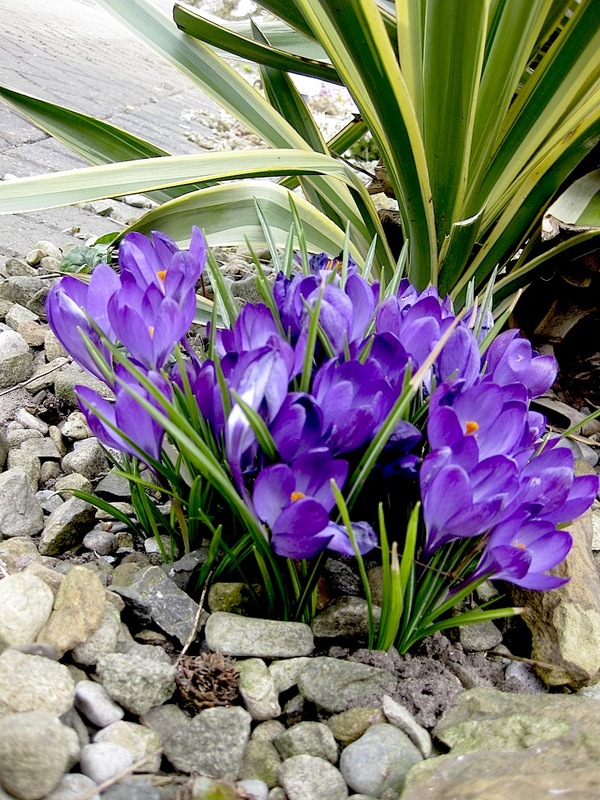 Spring bulbs do not need lifting and dividing as they go from strength to strength each succeeding year. The upside of my inability to see clutter is that all my bulbs die down naturally and do not suffer from any enthusiasm for me to cut them back prematurely when they start to yellow. All my bulbs are allowed to self seed and because my weed control is sound, my soil is always receptive to their germination. 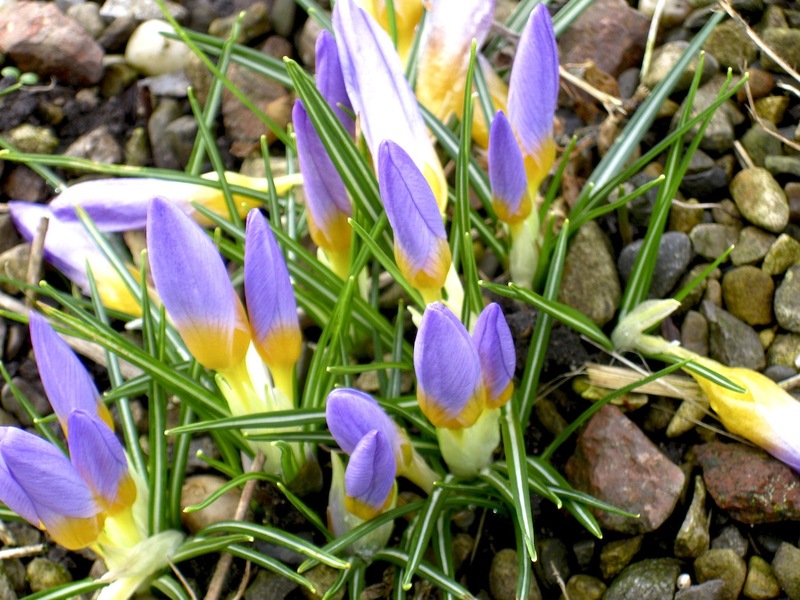 Much of the seed requires the next winter’s cold to germinate and it is an extra thrill to find drifts of seedlings emerging amongst the Spring flowers. Dwarf varieties are my favourite kind of bulb and this horrible Winter has not been totally bad news for them. 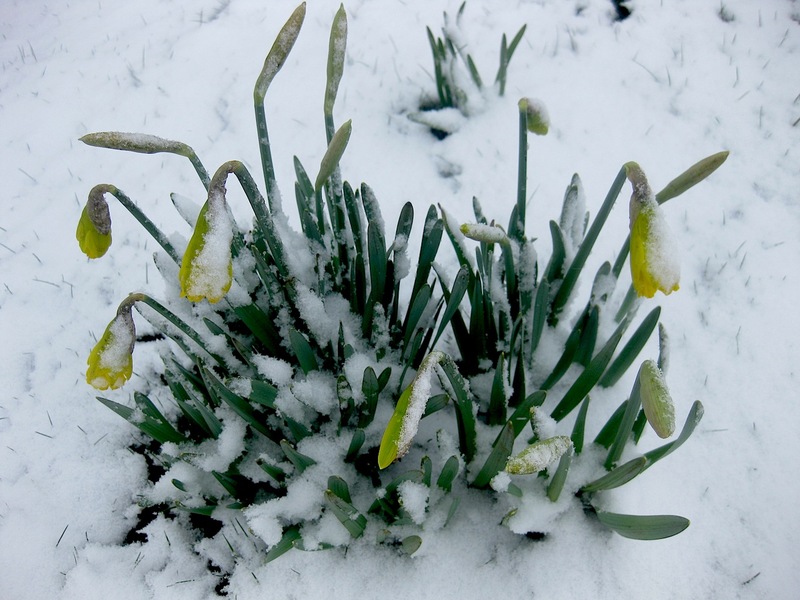 They are very resilient to frost and snow (snowdrops generate their own heat to push through the snow) and surprisingly sturdy with regard to this persistent cold dehydrating wind that has scorched many other Spring flowers. An extra bonus has been that bulbs such as snowdrops have lasted so well and now that mother nature has released her grip we can now look forward to some particularly prolific displays. 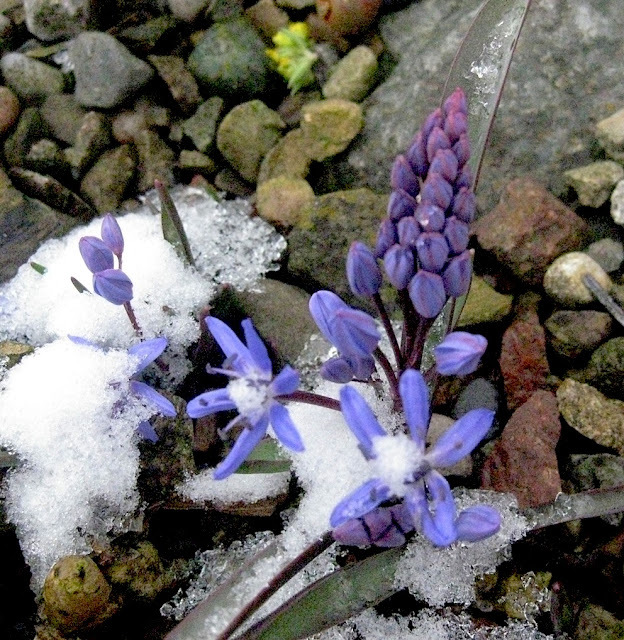 It is not my intention today to write about specific bulbs but I cannot resist a special promotion of the commonly overlooked Scilla bifolia. You do not find it in the garden centre and it is usually tucked away in any bulb catalogue. It is my absolute favourite and is a prolific self seeder. If it covers the whole of my garden I will be in heaven.